The Beer and Donuts Gift Set is the perfect birthday gift! Available for next day delivery in Las Vegas, Nevada. Including a 6-pack of your choice and a dozen gourmet donuts from Pink Box Donuts. The Beer and Donuts Gift Set is the perfect birthday gift! Available for next day delivery in Las Vegas, Nevada. Including a 6-pack of your choice and a dozen gourmet donuts from Pink Box Donuts. Pairing doughnuts and beer is a new trend that everyone can enjoy. For other great birthday gifts, check out our donut gifts and beer gifts. 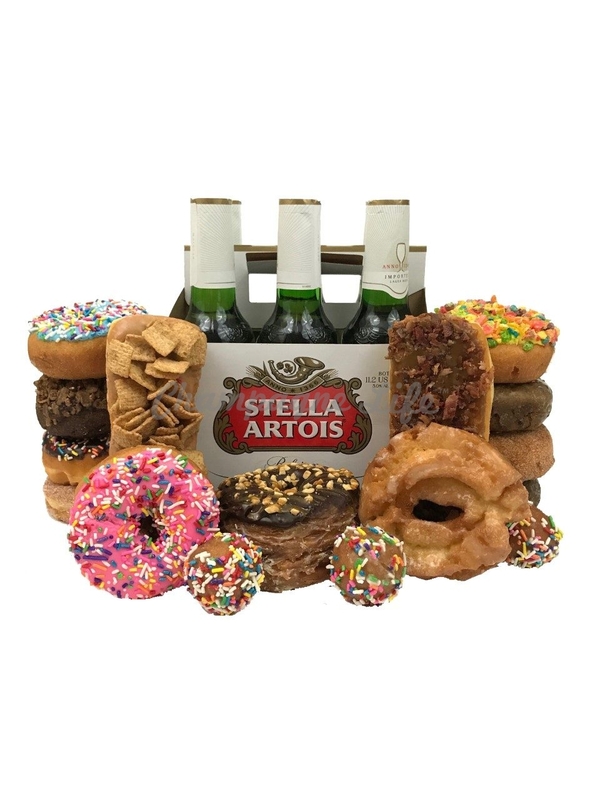 All beer gift baskets and Donut gifts are available for delivery to all hotels and casinos on the Las Vegas Strip, Las Vegas Residences and Las Vegas Businesses. Champagne Life will gladly design a custom gift for you, please complete the custom gift order form. Be sure to check out our most popular Champagne Gifts and Birthday Gifts. Champagne Life is proud to be Las Vegas #1 Gift Basket Company since 2013.